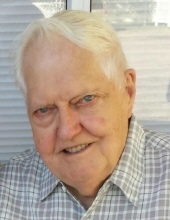 Hobbins, Richard Samuel - Age 87, of Swartz Creek, died November 23, 2018. Funeral services will be held 11 AM Thursday, November 29 at Sharp Funeral Homes, Miller Road Chapel, our temporary location at the Hill Creek Church, 5363 Hill Road, Swartz Creek. Interment services 2 PM Thursday, November 29 at the Ferris Township Cemetery, Vestaburg. Visitation will be 2-5 PM Wednesday, November 28, and 10 AM until the time of the service Thursday at the Hill Creek Church. Those desiring may make contributions to the Alzheimer's Association. Richard was born on November 12, 1931 in Spring Arbor, Michigan, the son of Walter George and Arlie Elizabeth (Parshall) Hobbins. He was a veteran of the U.S. Army serving during the Korean War. He married Frieda Irene Corder on October 1, 1960; she preceded him in death on July 7, 2015. He retired from General Motors in 1994 having worked in Tool and Die with many years of service. Richard enjoyed puzzles, traveling with family, and fishing with his father-in-law. He was the quiet caretaker of his loving wife before her death in 2015. Surviving are six children, Rebecca (Michael) Bur of Lennon, Steven (Cheryl) Webster of South Milwaukee, WI, Linda (William) Clayton of Houghton Lake, Sharon (Thomas) Green of Swartz Creek, Karen (Roger) Smith of Swartz Creek, Scott (Angela) Hobbins of Flint; 16 grandchildren,; 11 great grandchildren. Richard was preceded in death by his parents; wife Frieda; and brother George. Tributes may be shared at www.sharpfuneralhomes.com. To send flowers or a remembrance gift to the family of Richard Samuel Hobbins, please visit our Tribute Store. "Email Address" would like to share the life celebration of Richard Samuel Hobbins. Click on the "link" to go to share a favorite memory or leave a condolence message for the family.